22/07/14 – Witold Bryndza helps us to preserve level design assets for the game. A promising game from the once promising Cherry Software. 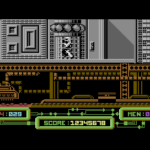 Coded by Taboo, the style of game was to be a cross between Flashback and Impossible Mission. The intro features a stunning 3D filled vector car driving around with fluid movement (Reminiscent of the Another World intro). Also it featured some haunting music by Shogoon and some nice graphics to match. I still remember being shocked watching the intro. The game actually came to a halt when the development team went their own ways with other projects. 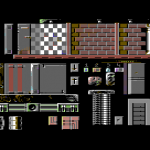 According to the programmer, the game was very close to completion in terms of the engine, all that needed doing was the level design. A huge shame… Nothing was ever seen apart from the intro sequence, but GTW is proud to show you part of what the game was to look like. There are now some screenshots of the game’s main character moving around… and its VERY Flashback style!… Taboo kindly handed over all the game and its sources, but sadly these bits were lost a few years back in a hard drive crash, and are currently being recovered again from Taboo for GTW release. The game never really got to a playable state before it was cancelled. It would have been no doubt a Flashback/Impossible Mission clone. Some basic level design work was actually started, and Witold Bryndza found the disk with the artwork on after a 5 year search! Now in 2014, we can show a bit more of the game. See the downloads for an extra graphic disk with the 4 top files being executable and showing the impressive graphical asset work which was intended for the backgrounds. 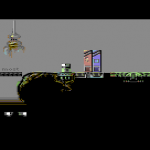 As you can see, the game was very much a Flashback looking game, and one which would have ran on a stock C64 machine. Trivia – Commodore Format once cocked up by proclaiming the intro to be the introduction to a Seuck game called Road Course.